Delve deep into the mysterious and captivating world of the Pharos, slide down golden sand dunes, explore ancient pyramids and unveil a treasure trove of ancient spoils, but beware of the vengeful Mummies who ruthlessly protect their treasure-filled tombs. This Ancient Egypt online game slots, will transport you back in time and lead you to the interior chasm of a luxurious ancient pyramid that will dazzle your senses from the outset. You won’t believe your eyes when you see the ornate and decadent pillars inside the pyramid and the flaming torches which cast their light on the gold within. 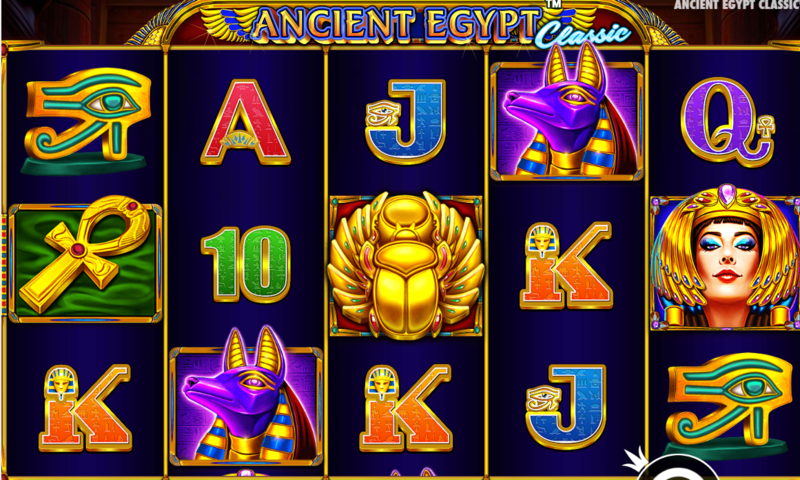 Ancient Egypt Classic is a decadent looking slot game with a simple game set up of 5 reels and is played across 10 paylines. To keep you interested and help you along your way to riches, there is a bonus round in which you can win yourself unlimited free spins with the expanding symbol. 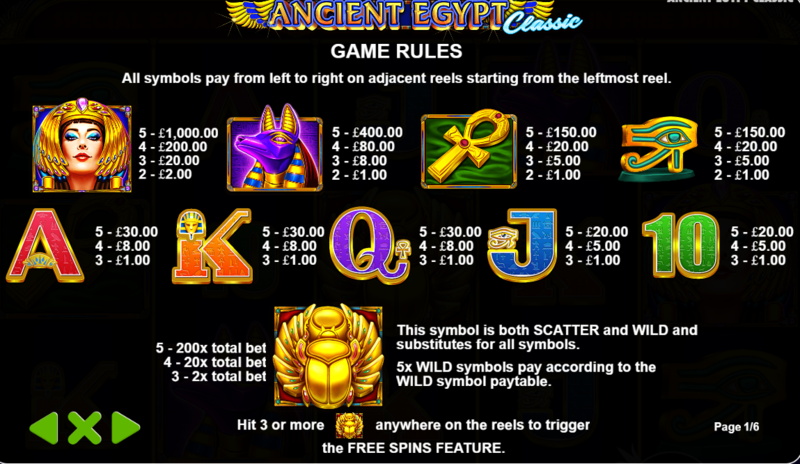 The slot game features all the usual suspects but also incorporates some higher paying game themed symbols to bring the theme throughout the game and include Hieroglyphs, The Eye of Horus, the Anubis, the Ankh Cross and Cleopatra herself. The higher paying symbols pay anything up to a whopping 75 x your stake per payline, with the beautiful Cleopatra symbol being the highest paying symbol on the reels. The Egyptian Queen will reward you handsomely if you land 2, 3, 4 or 5 of her sought-after symbol on the reels with a maximum of 500 x your stake. The games Wild and Scatter symbol all in one is the glittering golden scarab beetle, so keep your eyes peeled for the scuttling insect as if you land 3, 4 or 5 of the sacred beetle you will be granted up to 200 times your stake. That’s not all, this will also trigger the game’s fantastic free spin feature where you will be rewarded with 10 free spins. The visuals in this game are stunning and will appeal to anyone who enjoys playing a slot game that oozes luxury and grandeur, especially if you’re a history buff with an interest in Ancient Egypt. Besides the excellent graphics and the intriguing theme, the gameplay is smooth and easy, which makes it an ideal slot for beginners as well as more experienced players. Better still, the game is optimised for mobile and tablets as well as desktop play, so you can walk like an Egyptian and spin the reels inside the Egyptian tomb until your heart’s content, wherever and whenever you desire! Have a look through EasySlots to learn more games with an Egyptian theme.